Learn how a new phishing attack wreaks havoc - and what you can do to avoid being compromised. 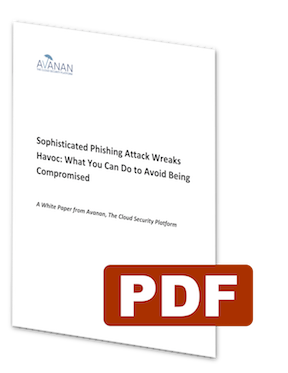 For a comprehensive look at a very clever but devastating phishing attack, and how to prevent it, download Avanan's new white paper entitled, Sophisticated Phishing Attack Wreaks Havoc: What You Can Do to Avoid Being Compromised. Use the form at right to download this comprehensive guide to the latest phishing attack and how to safeguard against this and similar future attacks.